Keyword intent is one of the most crucial aspects of paid search. Without a keen understanding of the intent behind visitors’ searches, even the most well-funded PPC campaign will almost certainly fail. However, by leveraging keyword intent for intent-driven marketing, advertisers can not only increase traffic to their sites, but also attract more qualified prospects, driving more sales and generating more leads. High intent keywords are also said to have high commercial intent. These keywords signify a strong intent on the part of the searcher to conduct a transaction, whether it be to buy something, inquire about a service, or another type of action that has a strong possibility of leading to a later sale. Commercial intent keywords are only relevant to transactional searches. If keywords can be considered “signals” from prospective customers, keywords with commercial intent are the most promising. By contrast, low intent keywords are those that can be considered either navigational or informational in nature. Someone looking for information on a given topic or searching for a specific website is unlikely to commit to a purchase as a result of these types of searches, meaning their commercial intent is considerably lower. Just as the desired actions that a visitor may take will vary widely from one business to another, definitions of high commercial intent keywords can also differ. However, there are two primary types of commercial intent keywords – “buy now” keywords and “product” keywords. These keywords, while different, all serve the same purpose, which is to convince a prospect who has already decided to make a purchase to take action by offering additional incentives. “Buy” is the strongest of these keywords, as this indicates the strongest possible intent to purchase something on the part of the prospect, but the others also signify strong commercial intent. Some of these keywords will be more valuable than others, depending on the nature of the business. For example, branded and product-specific keywords are highly competitive, but convert very well. Although “comparison” and “review” keywords may not seem as strong as some of the others, these keywords can still convert highly as the intent to purchase is still there – the prospect might just make the advertiser work harder for the conversion. When creating a list of product keywords, it is important to note the distinction between lead and product searches. This is crucial for service-based advertisers. For example, a prospect would not expect to “buy” a lawyer, but hire one. This means that although the prospect is considered a strong lead, the potential customer will likely need to call the business to discuss their situation further. For these reasons, “best” might be considered the strongest product keyword for a service-based businesses, as well as keywords such as “free consultation”. Product searches, on the other hand, can be completed entirely online and focus solely on a specific product, so product keywords such as “affordable” and “cheapest” are likely to be the most effective (and most competitive). Many advertisers mistakenly believe that exposure is more important than attracting qualified traffic. The notion of appearing to as many people as possible, rather than willingly narrowing ad campaigns to targeted, qualified visitors is tempting, particularly to new advertisers. However, this is a mistake. Failing to consider the intent of searches means that the daily budget specified by the advertiser is likely to be exhausted much more quickly than it would be only targeting visitors who exhibit high commercial intent with their searches. Another drawback of the “quantity versus quality” approach to PPC is that if visitors performing informational or navigational searches click on ads without the intent of purchasing anything, the advertiser is still charged for those clicks, resulting in wasted spend on traffic that will never convert. High commercial intent keywords, on the other hand, offer several advantages to advertisers. For one, the searcher is clearly indicating their intent to make a purchase by including high commercial intent keywords in their query. Secondly, both Google AdWords and Bing Ads offer a variety of advertising formats that are ideally suited to high commercial intent keywords, such as Shopping Ads, which are highly attractive to searchers with commercial intent. Keywords with strong commercial intent can also be significantly more cost effective, as click-through rates are strong, conversion rates tend to be higher, and advertisers utilizing them often have significantly reduced rates of wasted spend. One of the best ways to identify high commercial intent keywords is by using WordStream Advisor. 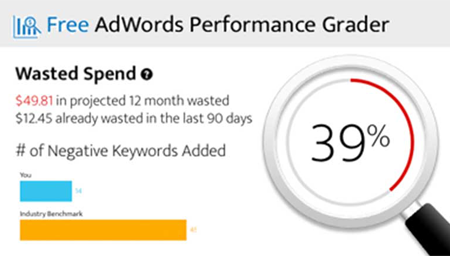 Offering an intuitive workflow and numerous smart tools that integrate seamlessly with your Google AdWords and Bing Ads accounts, WordStream Advisor can help advertisers identify high commercial intent keywords that are relevant to their businesses. In addition, WordStream Advisor can make intelligent recommendations on negative keywords, ad text optimization, and several other PPC best practices that reduce wasted spend and increase conversions. Get a free seven-day trial to WordStream Advisor today and start targeting traffic that is ready and waiting to make a purchase.